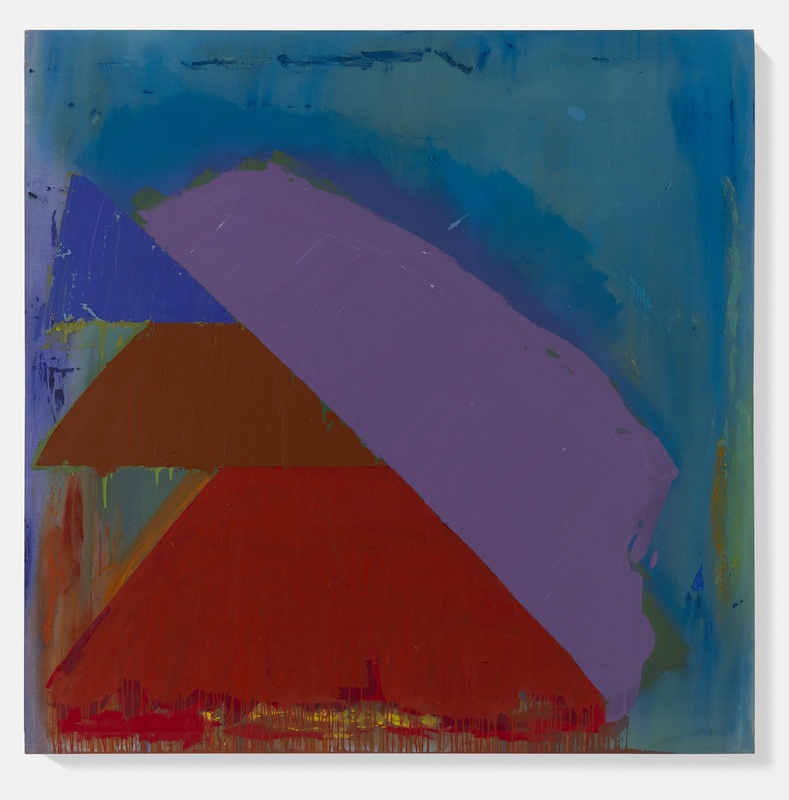 Damien Hirst’s new gallery is open for business and, surprisingly perhaps, he has chosen to showcase a particular period of the work of John Hoyland. Power Stations 1964-1982 launches the Newport Street Art Gallery in Vauxhall, London. Although Hirst has mentioned his deliberate challenge to those who say you can’t make and curate at the same time, I would have thought his way of making was very much in tune with the approaches of a curator. Get something interesting into a box, just on this occasion make it a bloody big box. Good for him to do this, though. I’m sure there is a sense of intrigue as to what will come next, but for now we can enjoy the wonderful spaces that this former scene-painting studio houses and get a meaty glimpse of the work of a significant British abstract painter to boot. 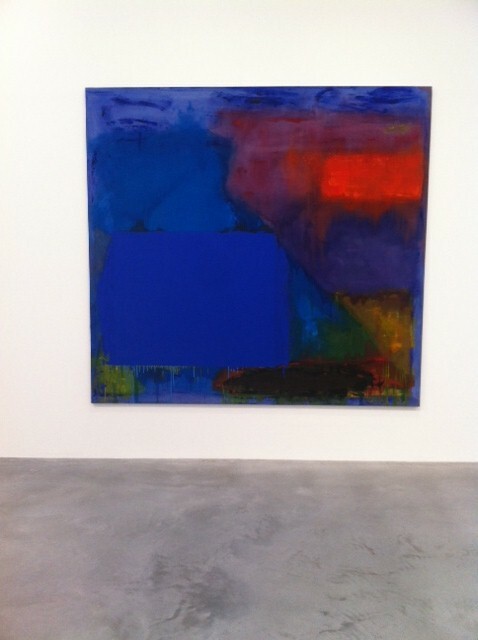 John Hoyland was very much the transatlantic painter during this period. The works on show are a European /American fusion; a sort of easel meets west. Big, strident fields of highly chromatic, intensely saturated colours, stained into the canvas, greet us as we enter the ground floor gallery spaces. Initially it’s a ‘wow’ moment; so much abstract painting is rustic and dinky these days that the chance to see works like this is a bit of an oasis in the desert. I am more than ever convinced that when it comes to abstract painting, the bigger the better. Moving through the chromatic fields and giant geometries we walk up stylish stairs to the upper floor to see a series of paintings with more awkward junctures of shapes – diamonds which balance on the edges of paintings and squares that jar against forms or clouds of impastoed colour. There’s little or no let up in the colour intensity. It’s all heady stuff and the gallery space is fantastic. John Hoyland, ‘Advance Town 29.3.80’, © The John Hoyland Estate, Photo Prudence Cuming Associates. John Hoyland, ‘28.2.71’, © The John Hoyland Estate, Photo Prudence Cuming Associates. After this wrestling match of colour and shape we have a room dedicated to a series of, at first glance, slightly wayward works with a pastel, plaster, bleached chocolate and vomit palette. If the previous room was a wild party, then this room is definitely the morning after; spatters of acrylic pepper these works as if fired from a paint bazooka. This wilful foray into tints and textures is a clear counterpoint to the full throttle primary/secondary approach that abounds elsewhere. These cooler more subtle shifts of colour relate to each other in more integrated ways and the visual ‘press’ of the colour works in a frontal way. Although they are devoid of any of the angular tensions of the higher keyed works, I was very aware of the lump of paint, the splat of mark or the hewn shape to a greater extent than the full force of the colour. The invention at the surface, though, seemed greater, as if the paint was being made to work harder to compensate for the overt loss of saturation. 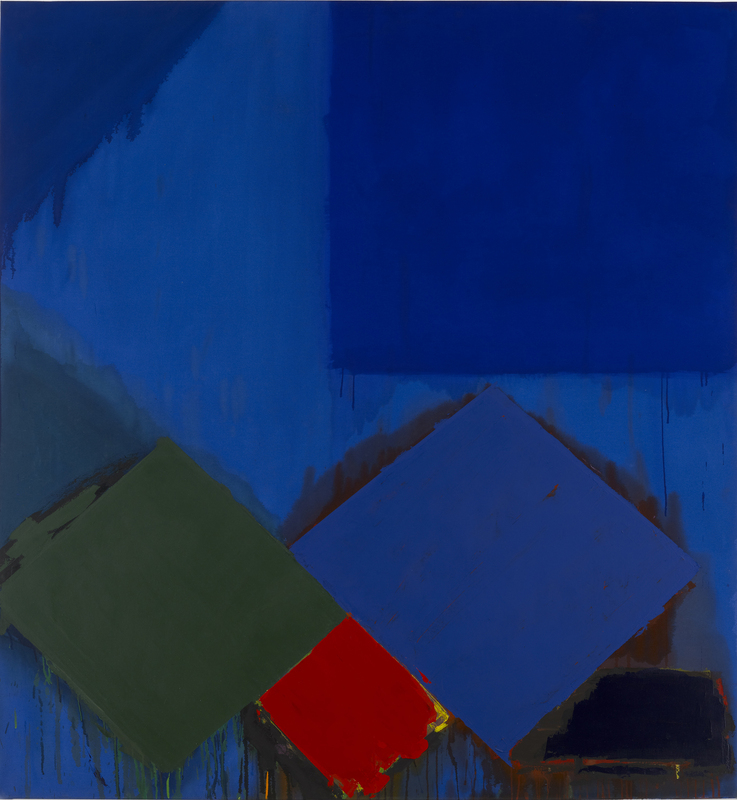 John Hoyland, ‘Scando 2.10.80’, © The John Hoyland Estate, Courtesy Murderme Collection. It can be a thankless, cheap-shot task to pick holes in someone’s work and it should be worth mentioning – especially to the more literary minded – abstract painting is a very, very hard discipline. 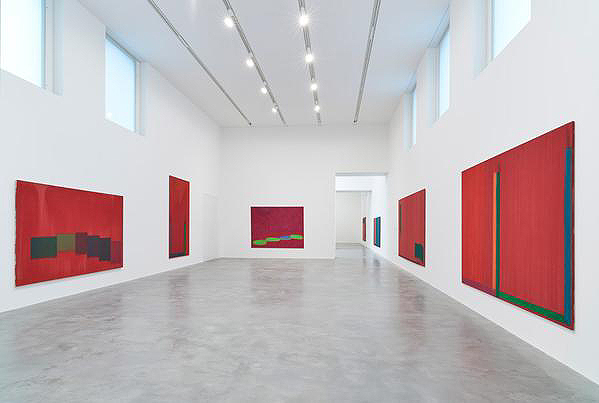 Hoyland’s paintings deserve to be seen in these large spaces. He really gave it a lash as they say and the energy of the works is infectious. His best works stand up well to those that he admired across the Atlantic; they lack a certain finesse of colour that you would get in a Noland or an Olitski and sometimes he’s guilty of negating his colour with a wrong ‘un, yet all in all his batting average is pretty good and it would be intriguing to see how they fare next to a Hofmann. Hirst too should be applauded for putting his back and his wallet into such an enterprise. Reading their interview is an enlightening experience; Hoyland comes over as a slightly bemused, avuncular elder painter, yet touched by Hirst’s enthusiasm. 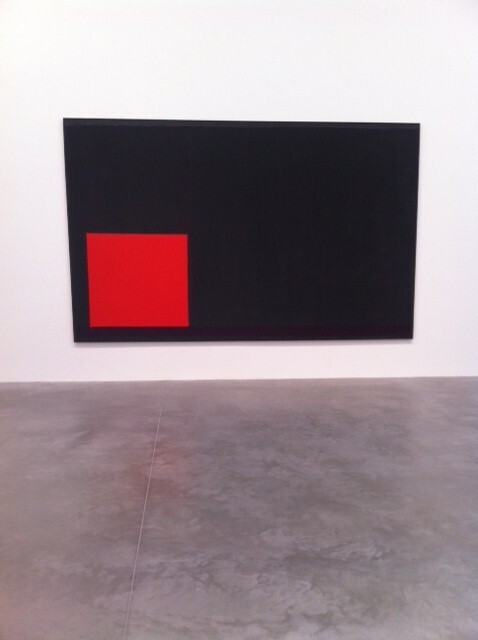 Hirst has a quality in his work, though, that Hoyland doesn’t – it’s that bloody-minded singularity. It may well be that lack of stardust that stopped him from reaching the dizzy heights of the Art world. His form of visual poetry perhaps comes out of the sensibility of an Englishman abroad. When it’s hot and sweaty, a T-shirt and flip-flops is better than a collar and rolled-up sleeves. The stand-out paintings for me were the two works that most successfully incorporated the scale of the mural with the specifics of the easel. 23.7.67 is a large black charcoal ground with three elements on it: a floating top grey bar hovers above a soft glowing scarlet square which sits on the left end of a beautiful simmering violet. The other was on the upper level, Cobalt Glide 10.11.80, with a rather lovely use of warm and cool blues and a melting orange. There were many other sumptuous colours… go and see! ‘Cobalt Glide 10.11.80’, photo Emyr Williams. ← #18. David Sweet writes on “Palaces, Pollock and Pixar”. This is such a powerful show, I was even more impressed than I expected to be. 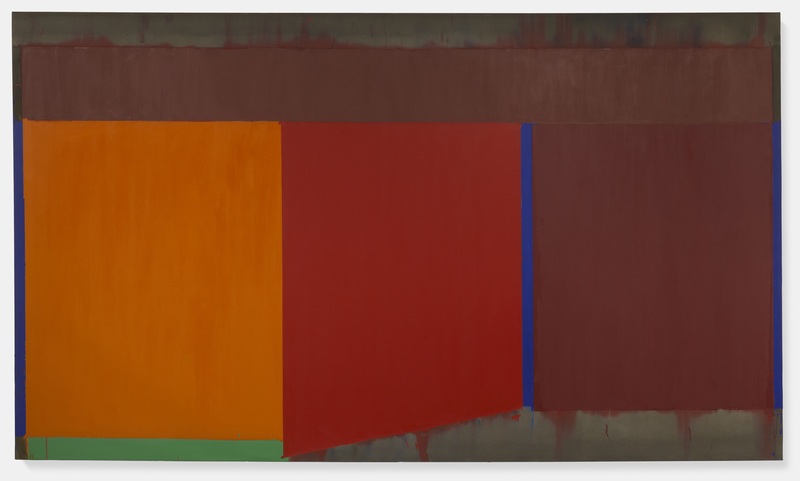 One aspect that reminded me of why Hoyland was a painter to admire and respect was in his decision making with choosing colours and applying them so directly. There is such overt confidence that perhaps reflected the time (especially the late 1960s) that he worked in. Even later, when he built up those Hofmannesque slabs I get a sense that he was not fussing around with the material (the paint is as physical as it is colour-shape). However, the section of paintings in the middle phase of this show baffled me. 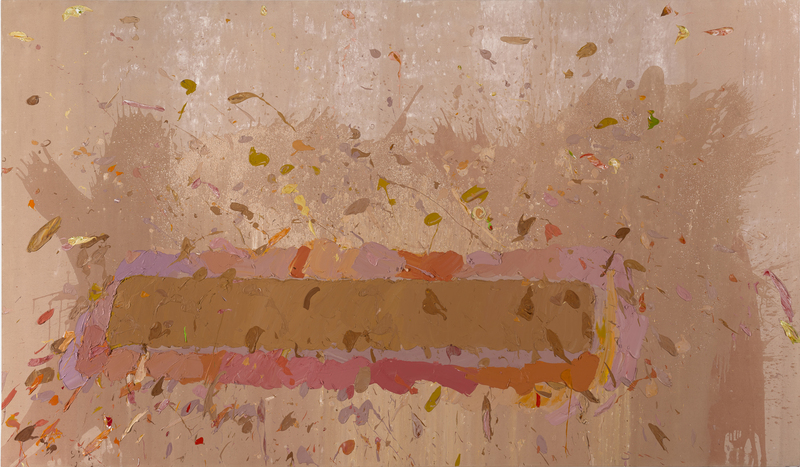 I wonder if Hoyland was struggling (necessarily, that is) to find his own voice – or (more likely) to ‘upset the apple cart’ by working with a very different palette and to engage more precariously with the paint? Emyr’s point about size is interesting. It seems an indulgence now to produce paintings so big. How many painters will have such an expansive studio space when rental costs are so high (in London and the south east, anyway) that enables large canvases to be made? I don’t share in all the positivity (apart from Jonathan Jones’ nonsense review) for Hirst’s first show at his new gallery. It’s all very well to demonstrate what an enthusiastic collector of Hoyland’s work he is, but I’m not convinced this particular selection does him (Hoyland) many favours. Whilst it gives the impression of a full-on retrospective of the first half of Hoylands career, it is most definitely not representative of the best works from those periods; and had Hirst rather less of an eye for bigging-up his own collection, and a more disinterested ambition for Hoyland’s long-term reputation, he might have done a lot better and made a much more imposing show by borrowing widely. It might well be that he has, for now and some time to come, pre-empted the possibility of a superior and more exhaustive retrospective happening elsewhere – at Tate, for example. I found this a difficult show to get very excited about, and whether that was because the works here are not the very best Hoylands one might wish to see together, or whether I’ve cooled on his work in recent years, I really can’t say. What I do know is that the last time I saw such a gathering of Hoylands early work, at ‘John Hoyland: Trajectory of a Fallen Angel’, Tate St Ives 2006, which covered similar territory, datewise, I was minded to think him as good as any painter anywhere in the world during the latter half of the sixties and all of the seventies. There are any number of really terrific paintings from 1970 to 1979, including spatter-paintings of a much higher key than those shown here, such as ‘5.9.70’ and ‘8.10.70’; and the great run of 8-footers from the 1979 Serpentine show, such as ‘Saracen 30.3.77’; Devilaya 28.12.77’; ‘Shelta 7.2.78’; and the Tate’s ‘North Sound’, 1979, Hoyland’s most open acknowledgement of his debt to Hofmann.